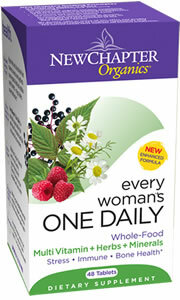 Every Woman's One Daily is a once-daily organic whole-food multivitamin formulated specifically for the needs of active women. Most people would agree that taking a daily multivitamin is a good idea it's often referred to as an “insurance policy” for covering nutritional gaps left by a less than optimal diet. New Chapter® believes a daily multi can be much more than a nutrient backstop. In fact, we believe our Organic, Whole-Food Multi's can serve as the foundation of your complete nutrition program with multiple benefits in support of your overall health and wellness. Every Woman®'s One Daily is a once-daily organic whole-food multivitamin formulated specifically for the needs of active women. Once-daily formula is easy-to-take, easy-to-digest , and can be taken anytime even on an empty stomach!